How to convert bmp file to word? 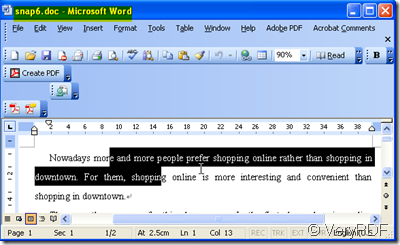 If you are anxious to know how to convert image to word, please read this article. I will take converting bmp to word for example to show you how to make the image file to editable word document. It is not hard to use this software because every details should be motioned have been stated on its website and software interface. But one thing needed to point out that as this software has 13 converting mode, please choose the right one for you. As to the details for the converting mode, please refer to this following picture. As we need to convert the image to word document, we should choose the 8th option in the output option if your image file written in English. If it is not written in English, please choose the corresponding language options. Cater to different customers requirements; we add a page rang option on its interface. 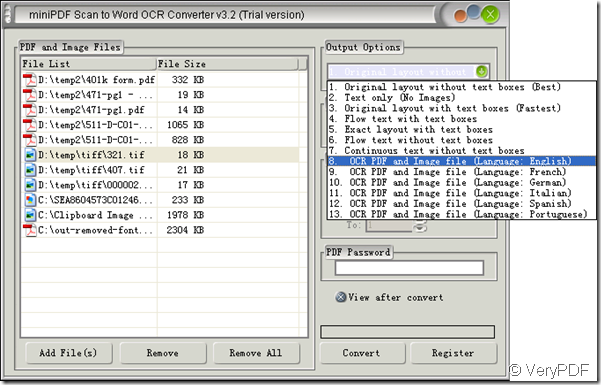 By this menu, you can choose the specified page in files to be converted. If we need to convert image file to word document, this option can be ignored. And the password option also can be ignored. Simply click the button “convert” then you can see the content of image file shown in the word document in a few seconds. By this way you can edit the image file content easily. Please check the converted doc file. In short, converting image to word can be concluded into three steps. 3.Click the button “convert” and choose a folder to save them. How to convert Russian image to editable word document? How can I convert a skewed PNG to editable Word? How to translate PDF file in Japanese to English? This entry was posted in OCR Products and tagged bmp to word, image to word. Bookmark the permalink.